This is Part Three of my week-long celebration of eggs. Our timid winter sun shone for two whole days this weekend and the light was glorious. But the snow is still there and the temperature is still well below freezing. I am now officially tired of winter and am quite ready for a week-long celebration of tropical drinks imbibed at swim-up bars on Caribbean Islands. In the meantime, here’s a little bit of summer on a plate – a warm and bright (hear that, sun? I said warm) potato salad taken from side dish to main dish by adding halved hard-boiled eggs. This is adapted from a recipe by Chuck Hughes of Montreal’s Garde Manger, a renowned restaurant in one of North America’s best restaurant cities. This salad is easily substantial enough to be a meal, but fast enough for a busy week night. Grainy mustard, white-wine vinegar and a bit of garlic gives it sharpness, crisp green beans give it more summer (hello, sun? ), while the anchovies lurk in the background giving flavour without being prominent. The eggs, served on top, cut the sharpness of the dressing wonderfully. Blanch the green beans in boiling water for 2-3 minutes until they are tender but still crisp. Plunge them immediately into a bowl of ice water to stop the cooking process and retain their bright colour. Boil the potatoes until they are fork tender (1o-12 minutes), drain and return to the pot to steam off for a few minutes. Make the dressing while the potatoes are cooking. Mince the garlic, mustard and anchovies together until they form something like a paste. Add the vinegar. Slowly add the oil while whisking or use an immersion blender. 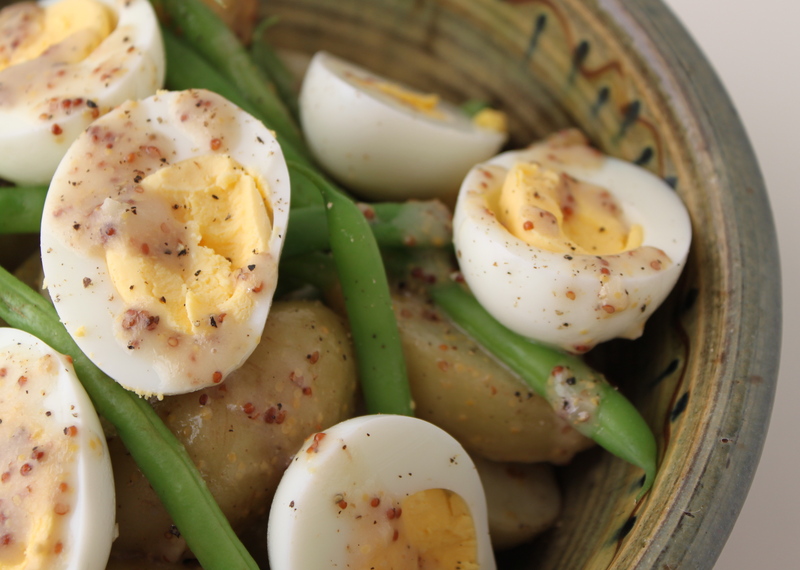 Toss the warm potatoes and green beans (be gentle) with the dressing and top with the sliced eggs. Serve while warm (the salad, that is). This entry was posted in Eggs, Salads. Bookmark the permalink. I just had lunch but I would take a nice bowl of this right about now!! Anchovies are a interesting touch. I would replace the canola oil with olive oil – stronger flavour but I accept that for the higher nutritional content.